You will find the awesome 2016 Toyota Avalon at the intersection of luxury and performance. No kidding, you have to sit inside the inviting new Avalon and get lost in its heavenly upholstery to understand what we mean. A rich interior with all the amenities of a fine limousine is just part of the picture. The Avalon accelerates like a drag racer, zooming for zero to 60 in a gulp-worthy 6.1 seconds. Imagine a ferocious full-size luxury car that takes off like a shot! The only other place you see that kind of souped-up elegant power is in a Richie Rich comic book. You may have seen our facility at 1 Superior Crescent Charlottetown, PO BOX 730 in Charlottetown,PE, and now is the perfect time to drop by. We have a strict no-pressure policy and a refreshingly low-key approach to car shopping. 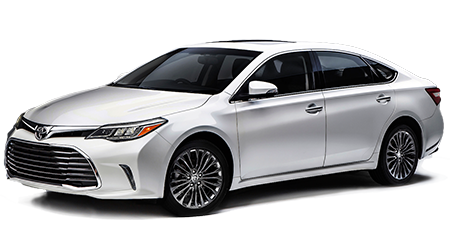 Actually, we know the new Toyotas sell themselves and we just enjoy riding along on your test drive, because the new Avalon is a pleasure to experience. The Avalon is a stunner inside, outside and under the hood. It brings smiles and knowing nods from snobby valet parking guys, and it looks good equally good cruising along the highway, or just stopping at the dry cleaners. The new Avalon looks a lot more expensive than it is, and parking it on your driveway will boost the curb appeal of your entire house. While it is hard to improve on perfection, the 2016 out does itself with even more innovation. Every 2016 Avalon now comes standard with race-inspired paddle shifters mounted on the steering wheel. Talk about putting the world at your fingertips! These precision controls respond to your every whim, so be sure to give them a try during your test drive. Even in reverse, the amazing Avalon is forward-thinking, with a standard high-resolution back-up camera that comes on when you shift gears. The Avalon has everything you can think of, and a lot of stuff you never even imagined. The 2016 Avalon may be stylishly handsome and unspeakably plush, but it is no showboat! One push on the accelerator releases the understated power of 268 hp and 248 pound-feet of torque from the exhilarating 3.5L V6 engine. However, thanks to special diffuser panels under the classy chassis, the Avalon cheats and silences the wind at the same time. With new aerodynamic tweaks, the Avalon gets enviable mileage and stays quieter than ever. That is the mark of a true luxury sedan and a whisper-quiet ride. On the highway, Avalon gets an EPA-estimated 31 mpg, which is unheard of in the world of full-size luxury vehicles, and it has earned an Ultra Low Emission rating. Driving the new Avalon is not a guilty pleasure, just a pleasure. The 2016 Avalon is the classiest luxury sedan ever produced under the Toyota nameplate. Doesn't your family deserve the very best? We are close to Charlottetown, Stratford, Mt. Herbert, Cornwall, Marshfield, Brackley, and Milton Station, so everyone is invited to our beautiful showroom at 1 Superior Crescent Charlottetown, PO BOX 730 in Charlottetown for a taste of the good life.